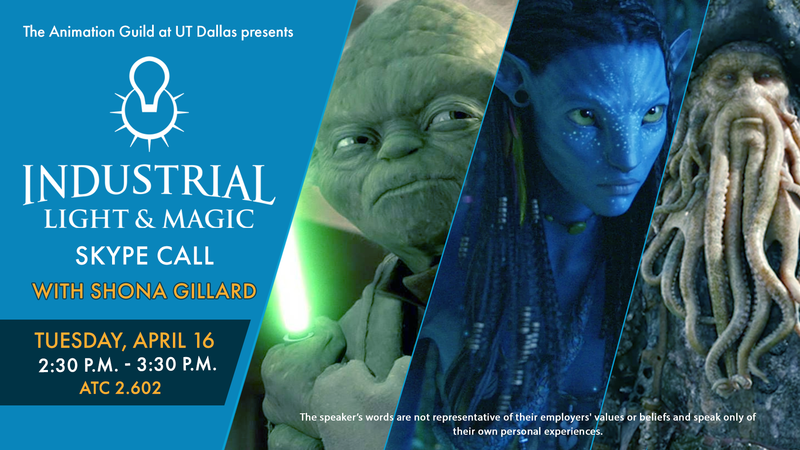 The Animation Guild would like to invite all ATEC students, faculty, and staff to attend a special presentation and Q & A session with INDUSTRIAL LIGHT AND MAGIC Pipeline Technical Director and Rigger, Shona Gillard on Tuesday, April 16! Shona is an ATEC alumni and has worked on various ILM projects and DISNEY INTERACTIVE'S Star Wars: Commander! ILM has done films such as Captain Marvel, Ready Player One, Avengers: Infinity War, Bumblebee, Bird Box, and more! 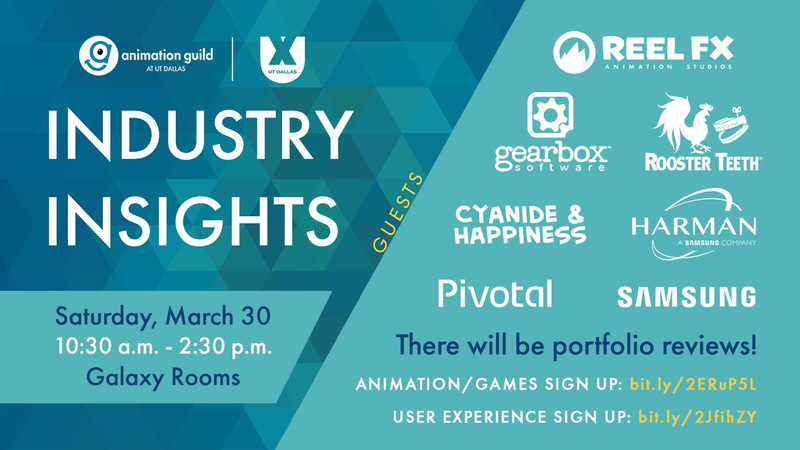 The Animation Guild would like to invite all ATEC students, faculty, and staff to attend Industry Insights Panel and Portfolio Review event! Come hear about local studio's thoughts and advice on breaking into the animation industry! Date: Saturday, March 30 Time: 10:30 a.m. – 2:30 p.m. Location: Galaxy Rooms Lunch will be provided. Join us this Friday, Feb. 22 at 1:30 pm in ATEC 4.910 with The Drawing Sessions. 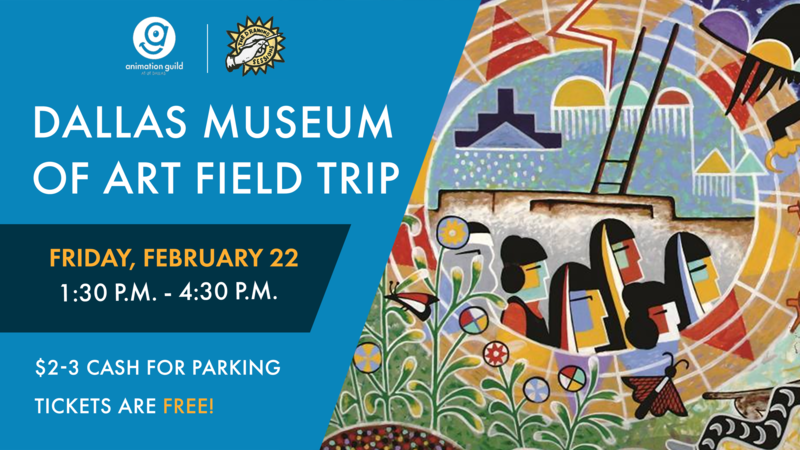 We'll be carpooling down to the Dallas Museum of Art to sketch and socialize! Join in on the fun, by joining the Facebook event! Carpool form available on the event page - if you need a ride, we got you! 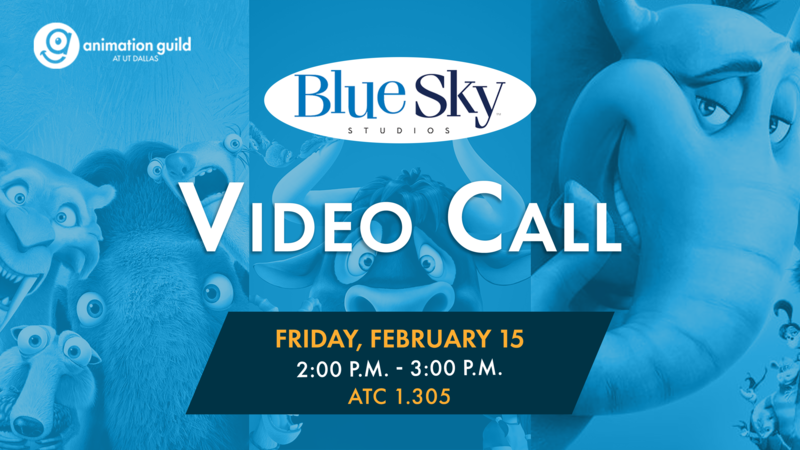 The Animation Guild would like to invite all ATEC students, faculty, and staff to attend a special presentation and Q & A session by BLUE SKY Recruiter, Mindy Berardini on Friday, February 15! Come learn about what Blue Sky looks for in intern applicants from the studio that brought you films like Ferdinand, Ice Age, Horton Hears a Who, Rio, and more! 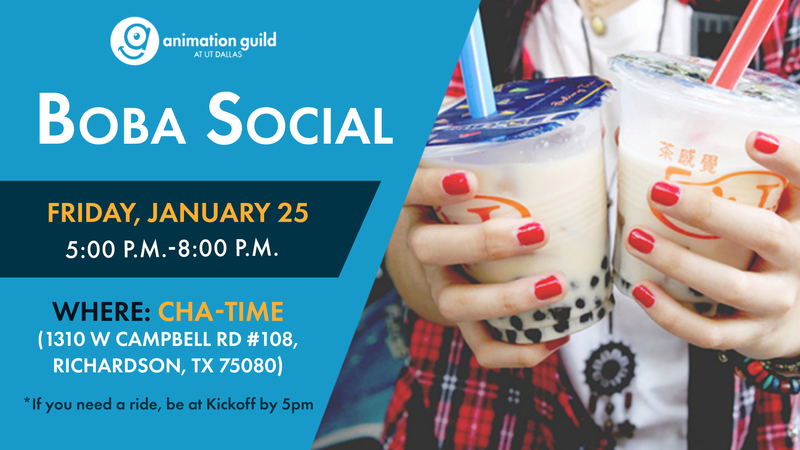 Join the ANIMATION GUILD for our Boba Social tomorrow! Catch up with old friends or make some new ones with us. This will take place right after our Spring Kick off event. Need a ride? Carpools are an option to those present at Kickoff. 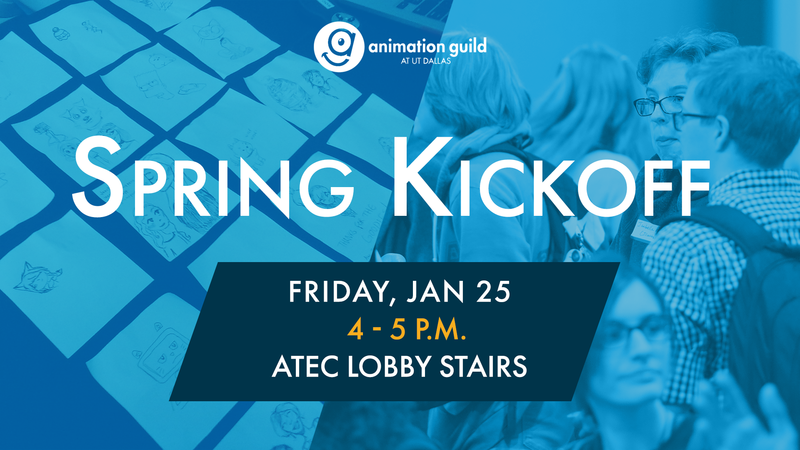 Come join the ANIMATION GUILD for our Spring Kickoff event. We will be discussing exciting events planned for the semester and welcome our new members. Support the ANIMATION GUILD! 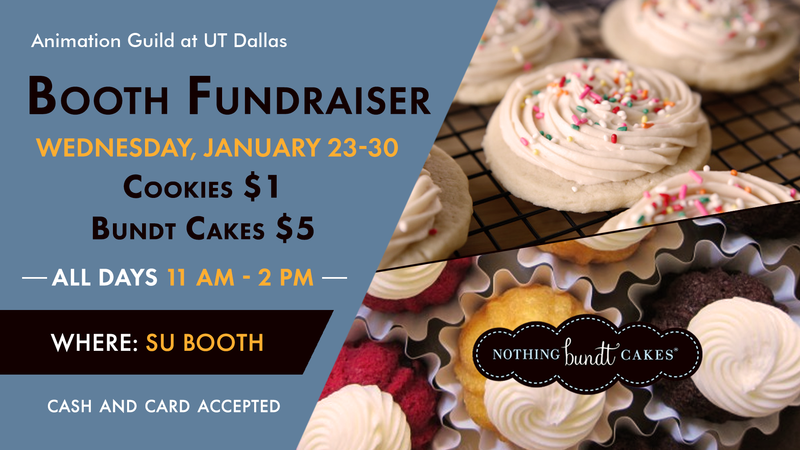 We're selling cookies and bundlets from Nothing Bundt Cakes in the Student Union. Spread the word! Your contribution allows us to create more exciting events by raising funds.